Mercedes has revealed their all-new 2012 CLS63 AMG sedan. Perhaps the biggest news about it is the new engine: the 5.5-liter twin-turbocharged V8 with 518 horsepower and 516 lb-ft of torque. 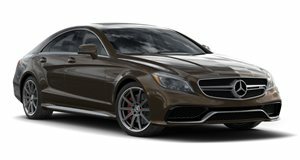 Because this is an AMG here, Mercedes is offering the AMG Performance Package on the CLS63, which raises output to 550 horsepower and 590 lb-ft. of torque. Isn't it great having your own in-house tuner. The four-door coupe is also equipped with AMG's seven-gear "Speedshift" MCT automatic transmission. As one can guess, performance will be downright sick. It'll hit 60 mph in 4.4 seconds and has a top speed of 155 mph (4.3 and 186 respectively if equipped with the AMG package). For anyone who cares (we don't), the car returns an estimated 16 mpg city and 21 mpg highway. AMG has also reworked the front axle by widening it almost an inch and added their independent adaptive suspension with electronic damping and a multi-stage traction control system. Set to go on sale this summer, it'll have matte gray paint with an interior featuring a combination of black carbon fiber and piano black trim with Alcantara headliner, and AMG sport seats.